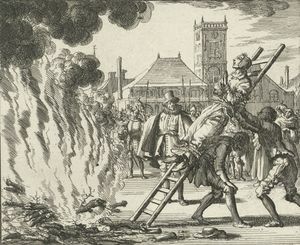 Burning of Anneken Hendriks, Amsterdam, 1571. Engraving by Jan Luiken in Martyrs' Mirror, v. 2, p. 539 of Dutch edition. Anneken Hendriks (Anna Heyndriksdochter, also called Anneke de Vlaster) was an Anabaptist martyr of Friesland, who was living in Amsterdam. Through treachery she was taken prisoner by the city officials. Because she held fast to her faith, she was severely tortured on 27 October 1571, with the intent of learning from her the names of other Mennonites. But even this ill treatment could not make her recant, and consequently she was put to death on the town square (Dam) on 10 November 1571. The execution took place in an unusually cruel manner. Anneken was tied to a ladder; her mouth was filled with gunpowder, and in this condition she was carried from the city hall to the ignited stake and thrown into the flames. She was fifty-three years old and an ordinary woman who could neither read nor write. In her sentence she was condemned because "she was married according to Mennonite custom, and at night in a country house." The Martyrs Mirror records that there is a song concerning her, but gives no further information, apparently meaning the song found in the Dutch hymn book Veelder-hande Liedekens (1569), which begins "Ick moetu nu gaen verclaren, Watter t'Amsterdam is geschiet" (I must now declare to you, What took place at Amsterdam). Braght, Thieleman J. van. Het Bloedigh Tooneel of Martelaers Spiegel der Doops-gesinde of Weereloose Christenen, Die om 't getuygenis van Jesus haren Salighmaker geleden hebben ende gedood zijn van Christi tijd of tot desen tijd toe. Den Tweeden Druk. Amsterdam: Hieronymus Sweerts, 1685: Part II, 537-538. Braght, Thieleman J. van. The Bloody Theatre or Martyrs' Mirror of the Defenseless Christians Who Baptized Only upon Confession of Faith and Who Suffered and Died for the Testimony of Jesus Their Saviour . . . to the Year A.D. 1660. Scottdale, PA: Herald Press, 1951: 872-874. Available online at: http://www.homecomers.org/mirror/index.htm. Grosheide, Greta. Bijdrage tot de geschiedenis der Anabaptisten in Amsterdam. Hilversum: J. Schipper, Jr., 1938: 310. Hege, Christian and Christian Neff. Mennonitisches Lexikon, 4 vols. Frankfurt & Weierhof: Hege; Karlsruhe: Schneider, 1913-1967: v. II, 282. Zijpp, Nanne van der. "Anneken Hendriks (d. 1571)." Global Anabaptist Mennonite Encyclopedia Online. 1953. Web. 24 Apr 2019. http://gameo.org/index.php?title=Anneken_Hendriks_(d._1571)&oldid=143839. Zijpp, Nanne van der. (1953). Anneken Hendriks (d. 1571). Global Anabaptist Mennonite Encyclopedia Online. Retrieved 24 April 2019, from http://gameo.org/index.php?title=Anneken_Hendriks_(d._1571)&oldid=143839. Adapted by permission of Herald Press, Harrisonburg, Virginia, from Mennonite Encyclopedia, Vol. 1, p. 126. All rights reserved. This page was last modified on 15 January 2017, at 23:15.